Mabel has been with us since August 2011. She enjoys going out with her regular walkers who all love her. She also enjoys having a good fuss made of her. Mabel is ideally suited to a home where she can become a companion to someone on their own who has no other pets (she really likes softly spoken ladies!) as once she puts her trust in you she will love you back completely. 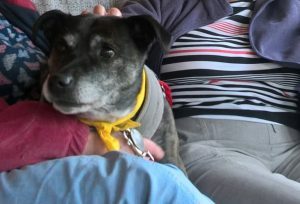 Mabel is getting spoilt with treats and nice walks now by a number of walkers which she so deserves. She really would be a good companion- very faithful to the right person in the right environment. 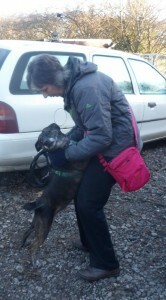 Mabel has also taken a shine to her new walker’s husband- they get on great. She enjoyed playing ball in their garden last week- how great for her to see what a nice home could be like. If only someone would give her the chance full time. Mabel was treated to a turkey lunch with her two walkers at their home over Christmas and really enjoyed herself! It would be lovely to see her in her own home for next Christmas lunch! 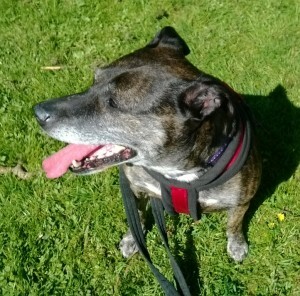 April 2014– Mabel is still enjoying her regular walks and loves to be fussed over. She still doesn’t care for other dogs though! We have told her she doesn’t have to love them just put up with them! Those of us who walk her and know her well love her to pieces and she returns the love too! If only we could find her a nice home it would be so good after being with us for over 2 and 1/2 years now. No one ever asks to see her to get to know her! 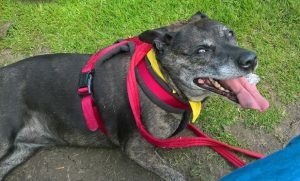 July 2014– Well still in the kennels! She is so loving lately when out walking. Enjoying the hugs and kisses we have when we sit a while on a bench by the river- usually after sharing a bacon sandwich, sausage roll or an ice cream, depending on the weather! If we are lucky we catch her other lovely walkers at their home on the way back and she gets even more treats and a fuss made of her. She is lovely. October 2014– Another bacon sandwich day!! What will we do when we can’t sit out by the brook when the weather changes- we have been so lucky on our walks this summer! 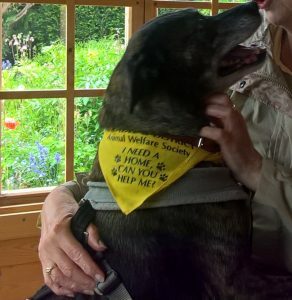 Although Mabel can be a little selective about who can fuss her in the kennels she has been absolutely delightful to lots of people who have met her about and about lately. She is trying so hard to show how lovely she can be as a companion. Here’s hoping that right person is just around the corner (without any other pets!!) waiting to take her home soon. Dec 2014– Still managing to get the bacon in on our walks and if we walk round via her other favourite walkers’ home, Mabel turns automatically into their drive so she can get even more treats and cuddles! She is very clever, Another trip to the vets today for the second half of her booster vaccinations. 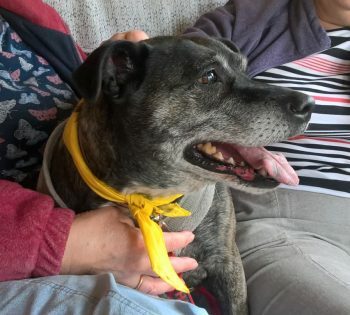 She made Nigel sit with her to get to know her before she would let him do the 1st half of the vaccs a few weeks ago and when Adam met her outside the vets today she had the 2nd half of the vacc from him in a flash without her even knowing it- what a good girl she was (she was chewing on a few treats!). Very proud of her. What a greeting she gives before setting off for our walks! She is lovely. March 2015 update. Mabel is becoming very used to her bacon with me on her walks and sausages with her other regular walker! She had a great walk today and was lovely. 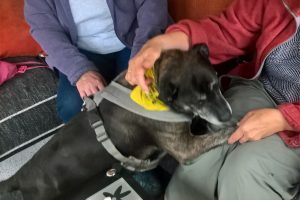 She met quite a few new people and enjoyed lots of fuss being made of her by them. What a good girl she was. To top off her walk we visited her other walker’s home for yet more treats! 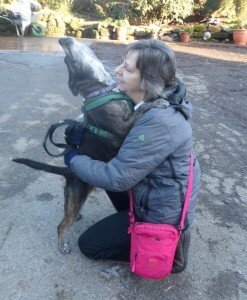 She would love to do that with someone all of the time and then go back to a nice home, not back to the kennels- even if she does think that’s home!. Well, Mabel is still here but enjoying her regular walks and treats. Lovely weather today for a nice morning walk by the river with time for her bacon and a photo shoot. (not that she keeps very still for that- prefers to have a cuddle instead!). 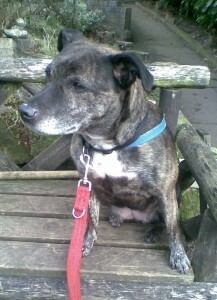 Still in kennels sadly but always enjoys her walks with Brenda and also Pat on various days of the week. She is a real character and loves a fuss and cuddle from them. She knows all the various walking routes to take and which houses to call into in case a friendly face is in! She doesn’t forget anything- certainly not the points on the walks when treats and her bacon ration are given! 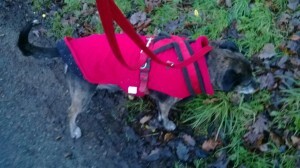 Another Christmas in kennels for Mabel, what a shame. We had a lovely time together again today. She is such a good girl with me. I always end up black mind you as she loves to put her front feet on me and give me a cuddle and kisses when I bend down to her as if to say ‘thanks for the bacon’ as soon as she has eaten it, or if we stop and sit on a bench for a ‘chat’! I’m really wishing her all the luck in the world for 2016 and hope that may be her lucky year and she finds her perfect home. I of course would still love visiting rights! 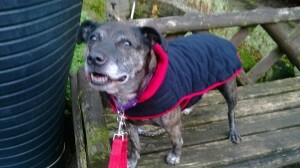 Mabel had a great walk again this week, even made a fuss of a nice young man who came across to say hello to her! 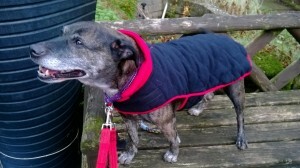 She also tried on a new jacket that has been donated for when its a cold night in the kennel. Very smart and warm. Well, Mabel is still here and still enjoying her walks out before she returns ‘home’. 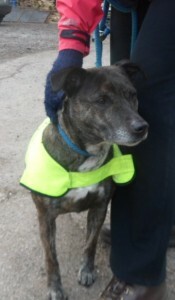 Its nice that she is settled and regards the kennels as her home but how sad is that really? She is still enjoying her bacon breaks on her walks and has had picnic stops during the summer for ice cream, more treats and a drink of water! 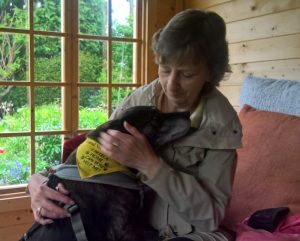 We drop in and visit a few people when we are out on our walks- for even more treats and so fusses can be made of her. A couple of times we have dropped in on people for coffee- today being one of them! She has also gained a new walker who is taking her out a few times in the week too which is lovely. Is this year going to be THE one for Mabel? I hope so. Still enjoying the bacon (three rashers now!) and our stop off for even more treats at a friends on her mid week walk with me. I think she takes me for a walk now as she knows all the possible routes. Her Saturday walkers think she is great too and also enjoy taking her out. 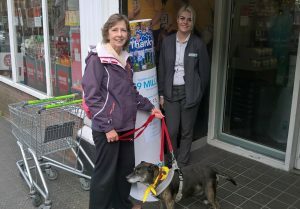 Mabel visited the local Co-op today to thank them and their customers for awarding us £1,501.03 via their Local Community Fund and then had a little rest halfway round her walk! Mabel enjoyed her visit for ‘coffee’ and treats today (the coffee was mine!) We relaxed in a lovely summerhouse and garden half way through our walk around the village and she was made such a fuss of, which she returned in abundance. Treats of course are always welcome. She really enjoys saying hello to people now and being told how lovely she is! She will say when she gets bored of sitting though and wants to carry on with her walk- but first checks to see if any more treats are left! She is a character. We’ll be calling again no doubt- but can’t give up on our other regular stop off home either! She has received a kong from a lady in Yorkshire which is lovely (particularly when it will be filled!) and a new blanket is also on its way to her which is most appreciated. Another visit to her friends’ today so she could have a big cuddle- she also gained a ball someone gave her on our walk which was lovely of them. Its about time she gained a home so she can get this treatment all of the time! 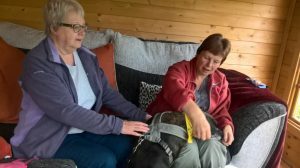 Well we’d have preferred Mabel to be in a lovely home by winter but to make it nicer for her in kennels we have given her a new luxury country dog heavy duty softee bed which she can really snuggle down in and keep cosy. She loves it! She settled in it straight away after her walk with me today and gave it the ‘paws up’! Along with the other dogs in our care, Mabel has moved to new kennels. She has settled in straight away. She still has her lovely big bed which has gone with her, with lots of blankets to snuggle down to and is enjoying her new nice warm kennel. She’s getting lots of nice long walks and is still able to visit her friends for treats and spend some time relaxing with them. Can this be her year to find a home? Surely so! 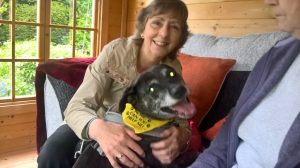 Can’t believe that it is 7 years this month since Mabel came into our care! 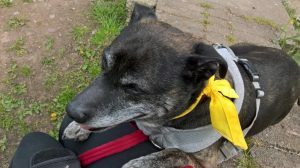 As well as her routine exercise she is still getting out and about a lot- at least 5 good walks a week with her favourite walkers. Still enjoying the bacon and stacks of treats she gets! She has added new areas to walk as well as the old haunts and found new places that provide food for her too! Sometimes there is more eating, having a fuss with friends and cuddles on the sofa than actual walking, but she is putting that down to it being such a hot summer- a girl just has to stay cool and she can’t ignore friends! We’ll see what the Autumn brings- wouldn’t a nice home be lovely!